The original marble floor of the Davenport’s lobby was one of the many historic features saved during the restoration. Karen and Walt Worthy are riding an elevator. Suddenly, Walt realizes something as they ride to the top of the Davenport Hotel’s parking garage. “I’m not sure I’ve ever ridden this elevator before,” he says to his wife, a smile taking shape in the corner of his mouth. It has to be one of the only spots on the Davenport’s sprawling campus that Walt Worthy hasn’t seen since he and his wife brought the hotel back to life 10 years ago this week. On July 15, 2002, a few rooms opened for a small group of guests — it was the first time the Davenport had been open as a hotel since 1985. The Worthys know this hotel inside and out. They bought it when it was rapidly falling into disrepair from years of neglect, employing a hands-on approach — personally selecting everything down to the design on the drapes. Taking over what was once one of the most iconic hotels in the American West was a gamble. Anyone who’s been around Spokane for a couple decades can tell you that. Hell, Walt Worthy himself will tell you that. But now the Worthys can walk through the ornately decorated historical hotel and point out the marble floors that were unearthed from beneath tacky 1970s carpet and painstakingly restored, or the bed in the Governor’s Suite that, like much of the hotel’s furniture, was handcrafted in Thailand. 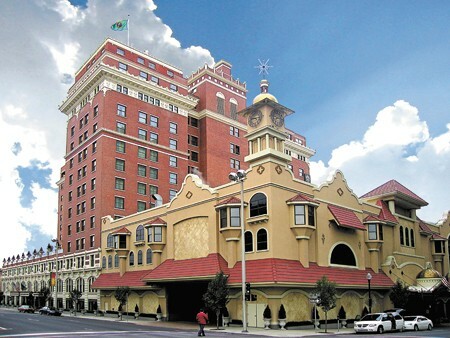 They can also explain how much the hotel, built in 1914 by Spokane legend Louis Davenport, has meant to downtown Spokane, and how presidents John F. Kennedy and Teddy Roosevelt each stayed here. As did titans of their time like Charles Lindbergh and Clark Gable. They can also tell you, though, how downtown Spokane was struggling even before the Davenport was shuttered in 1985 and how dangerously close the historic building was to being bulldozed in favor of a parking lot or left to crumble for years to come. “Whether we did or somebody else were to do it, Spokane wanted to see the hotel back on line again,” Worthy says in his Southern drawl, evidence of his Georgia upbringing. And for the Worthys, that’s perhaps the most rewarding aspect of the multi-million-dollar adventure they embarked on years ago. “We didn’t have any vague idea of what we’d raised our hand for, in terms of involvement that the hotel has had in the community. We’ve had so much support,” says Walt Worthy. 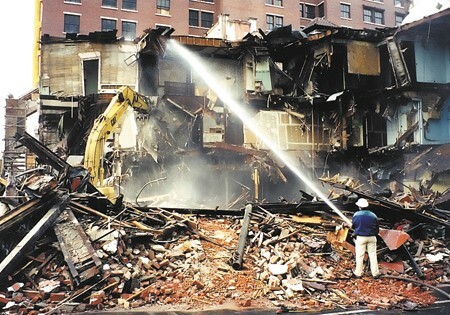 By 1985, the Davenport was shuttered and rapidly becoming more of an eyesore than a landmark. A Dallas-based mortgage firm owned the building and was pumping in more than $1 million a year just to keep the place standing. The building was for sale, of course, but with Spokane’s then-fragile economy, it seemed unlikely that someone would come along with enough cash for the $9 million price tag — and the millions more needed to get it back into working shape. That isn’t to say the hotel didn’t have supporters. 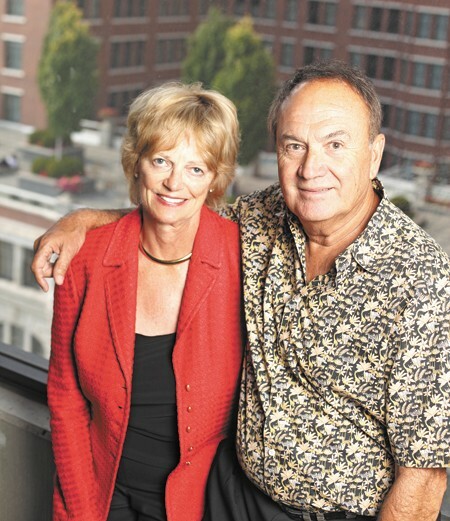 Sheri Barnard was a Spokane city councilwoman when, in 1985, she helped to found the Friends of the Davenport, a group that raised not just money, but awareness of the hotel’s precarious state. The group went as far as to purchase advertisements across the country in search of a buyer for the building. At one point, the group’s membership numbered more than 2,000. “If it was just sitting there closed and empty, I don’t know what would have happened. The downtown district was deteriorating,” says Barnard, who became mayor of Spokane in 1990, running on a platform that included support for downtown restoration. But even after the building was purchased by Sino Pac International Investments, a Malaysian company known for its mining ventures, the Davenport’s struggles continued. In 1993, it was revealed that an oil spill at the nearby Washington Water Power Steam Plant had seeped beneath the hotel, thus hampering Sino Pac’s plans of securing funding for a $20-plus-million renovation. Even selling the property would be a challenge: Whoever purchased it would also inherit the legal battle over the spill. So the hotel remained empty, even as urban experts like Neal Peirce (he studied the city in 1993 and subsequently published a report on his findings) called the hotel the single most important piece of the downtown restoration puzzle. Others, like Bob Ogden, then chair of the city’s landmarks commission, agreed. “I’d hate to see it hold up the progress of the hotel, because I consider the reopening of the Davenport Hotel as the most important piece in the rejuvenation of downtown,” Ogden was quoted in a 1994 Inlander article. As Sino Pac, led by the Ng family (who had hired now former-Mayor Barnard onto their staff), struggled to find the financial means to reopen the hotel, momentum on the Davenport effort dwindled during the latter years of the ’90s. The topic of downtown renovation became political, and supporting these measures became a liability for city council members and a couple of mayors seeking re-election. This is where Walt and Karen Worthy came in, buying the building and almost immediately announcing plans to resuscitate the aging Davenport. While there were naysayers in the business and local political communities, it appeared the Davenport would get a second shot, something for which Barnard and others had advocated, at that point, for more than 15 years. But the Davenport renovation would be no small task. Worthy says that some 2,000 semi-truck loads of debris were removed during the renovation, which included the Herculean task of literally moving the famed Hall of Doges from the hotel and into a different wing of the building. All the rooms were torn down and redone. New beds, custom made for the Davenport, were ordered, along with furniture, drapes, carpet and everything else that comes along with a hotel. 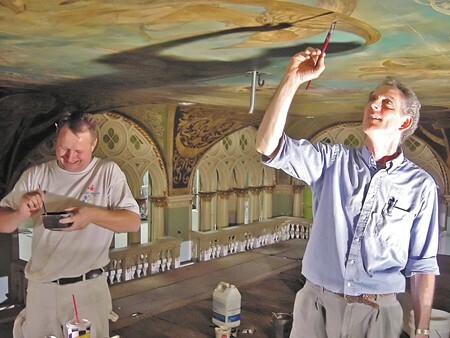 Historic fixtures and architecture were salvaged, hoping to maintain the legacy of famed architect Kirtland Cutter, who made the Davenport into a personal passion project of sorts. That marble floor in the lobby was saved and the ballrooms were brought back to life, hosting weddings and other events before the guest rooms had even been completed. While her political days are long behind her now, Barnard looks back on her time with the Friends of the Davenport, the city council and the mayor’s office fondly, knowing what the hotel has become. “It’s an accomplishment of the community. When I sit down in the lobby, it all comes back to me,” says Barnard, who celebrated her 75th birthday watching the Lilac Parade from a room in the Davenport back in May. “I’d been looking at it for a long time,” says Walt Worthy, leaning against a couch in the hotel’s Governor’s Suite, a view of downtown and beyond visible through the windows behind him. “He used to sit across the street in the parking lot and say, ‘Ya know, I’m gonna buy that building,’” says his wife, punctuating the quip with a chuckle. The Worthys were hardly neophytes to the construction business. Since moving to Spokane in 1968, Walt Worthy had climbed his way up from restoring and reselling houses to building and maintaining office buildings. He knew construction, he said, but he “couldn’t even spell hotel” when he bought the Davenport for $6.5 million in 2000. Today, the hotel’s impact is easily seen across downtown Spokane. First, of course, is the historic hotel. But there’s also the parking garage across the street and the addition in 2007 of the 21-story Davenport Tower, which added 328 rooms — hosting the likes of Jerry Seinfeld and Cher, to name a few — a restaurant and a bar to the hotel. Then, there’s the fleet of restaurants, including recent additions like the Post Street Ale House, and in 2009, the Worthys purchased Hotel Lusso, just a block from the Davenport. In October, the Davenport opens its own spa. The hotel has also increased focus on its meeting spaces, and ballrooms make up for a third of their business, according to Worthy. And that’s not counting the myriad other businesses that popped up in the wake of the Davenport’s reopening. “I think anybody in the downtown community could count [the Davenport] as a key factor in the downtown Renaissance,” says Marla Nunberg, vice president of the Downtown Spokane Partnership. A 1999 long-term plan by the Downtown Spokane Partnership flagged several “catalyst” projects that the business organization saw as instrumental in reviving downtown. The Davenport was on that list, in addition to River Park Square, the Convention Center expansion and the Steam Plant’s renovation. Between 1999 and 2009, Nunberg says those projects helped to bring $3.7 billion in public and private development to downtown. 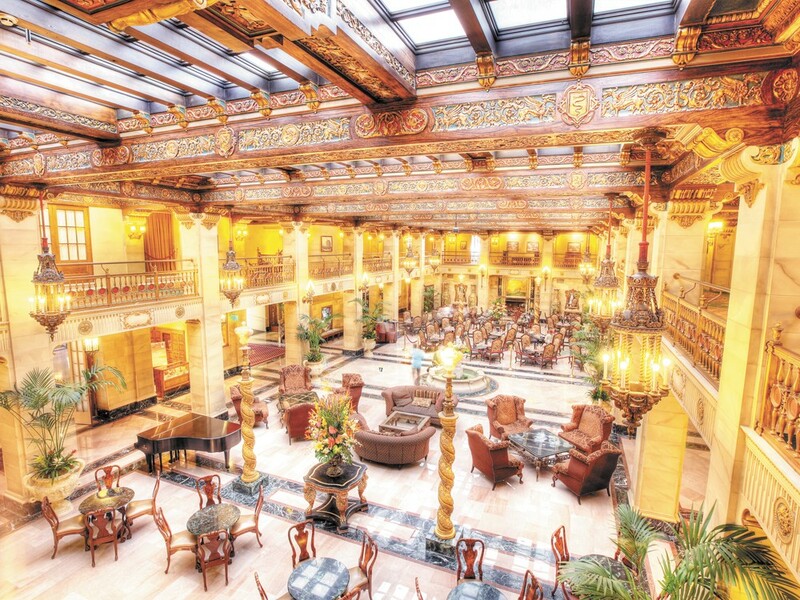 Local historian and Eastern Washington University professor Bill Stimson says that while the Davenport’s impact is unmistakable, there’s more to the story than just the hotel’s resurrection. You also have to look at the timing, he says, including the renovation of River Park Square mall, which was completed about three years before the Davenport reopened. “For River Park Square and the Davenport to fire up at the same moment is a significant moment in Spokane history,” says Stimson, author of the Spokane: An Illustrated History, who was also a longtime journalist for the now defunct Spokane Chronicle. “As a sudden transformation of both the city’s appearance and economic activity, I’d rank it behind only 1974 — Expo — and 1883, which saw both the first discovery of Coeur d’Alene gold and completion of the first transcontinental railroad through Spokane. Change usually comes more gradually to a city,” he says. Now a decade after reopening the doors of the hotel, the Worthys have no regrets with their decision to take over the landmark. Walt Worthy has no intention of being the next Louis Davenport when this chapter of Spokane’s history is written. He’d rather stay a few steps away from the spotlight, but the impact he and his wife have made on downtown may make that hard to avoid.